In this section we provide some background the different crops and field management options (fertilizer, tillage). This information can be used to make informed decisions in game play. The game is based on making decisions about tradeoffs between economic, energy production, and environmental benefits. These tradeoffs are summarized in the table below. Use this information as a rule of thumb guideline for making decisions. However, careful experimentation with different crops and strategies can help you uncover the exact effects of planting different crops and using different fertilizer levels and tillage techniques. Read below for basic information about each crop to help you select a sustainable planting strategy of the short and long-term. 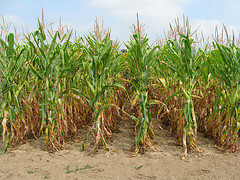 Corn is the most commonly planted crop in the United States. The grain is widely used to produce both biofuels, such as ethanol, and food for livestock and people. Scientists have recently discovered new ways to produce biofuels from rest of the corn plant called corn stover. Using corn stover to produce biofuels is an attractive idea because the stover is already being produced in great quantities and, unlike corn grain, is not used directly to feed people. Because corn has been grown and bred for thousands of years, farmers have developed sophisticated methods for producing high yields of the crop under a wide range of conditions. There are also very good markets for both corn grain and stover, which are important ingredients for food, fuel and other products. For this reason, corn is currently the most profitable bioenergy crop ($150/ton). However, there are also some drawbacks to planting corn. Corn is an annual crop. This means that farmers need to replant it every year, which can be expensive, takes time and has negative environmental impacts. Replanting, tilling the soil, fertilizing and harvesting every year can have negative impacts on soil health and produces more greenhouse gas emissions, such as carbon dioxide (CO2) from tractors and nitrous oxide emissions (N2O) from the soil. Also, like most annual crops, corn does not have very deep roots. When the plant is harvested, the remaining roots do not restore very much carbon to the soil as they decompose. Shallow roots do less to prevent water and wind erosion. In addition, corn needs large additions of fertilizers, pesticides, and water to grow well. This can be both expensive for the farmer and can harm wildlife and groundwater. Corn is a grown as a monoculture (only one crop type in the whole field). These conditions make it a poor habitat for insects, birds and wildlife. Switchgrass is native to the United States and has been growing wild in the country's grasslands for thousands of years. It is a hardy plant that grows well in a range of conditions thriving in upper midwest, central and southeastern U.S. In particular, switchgrass can grow well on soils that are too poor to support a healthy corn crop. It has received a great deal of attention recently as a potential bioenergy crop because it can produce good yields in poor soils with little water and fertilizer inputs. Unlike corn, switchgrass has been grown and bred by farmers as a crop only recently, primarily as a forage crop for livestock. Farmers and scientists have had less time to figure out the best way to grow and harvest this crop under a range of field conditions, but researchers are working hard to improve techniques for switchgrass cultivation. Switchgrass yields per acre are lower than those of corn, but the costs of production are also lower. Unlike corn, switchgrass does not have the same strong, well-established markets for both food and fuel. Farmers growing switchgrass can expect small profits in comparison to corn ($80/ton). However, it can be an appealing option to farmers because it can grow well on land not suitable for corn and has significant environmental benefits. 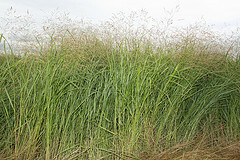 Switchgrass is a perennial plant that grows back year after year from its extensive root system. Therefore farmers can spend less time and money on replanting. Less time spent running tractors for tilling and planting, and less nitrate fertilizer use, also means less CO2 and N2O released into the atmosphere. Switchgrass's very deep root system helps take CO2 out of the atmosphere and store it in the soil. Deep roots also prevent soil erosion, chemical runoff and help the crop tolerate droughts. Like corn, switchgrass is grown as a monoculture. But because switchgrass is a native perennial, it provides more reliable habitat for birds, insects and other wildlife that have depended on the plant for thousands of years. Scattered weeds often grow in switchgrass fields, which also contributes to supporting biodiversity. Alfalfa is a common perennial forage crop. Alfalfa is native to Asia and has been grown for centuries as feed for livestock. Compared to switchgrass and corn, alfalfa produces lower yields and is not sold to produce any biofuels. 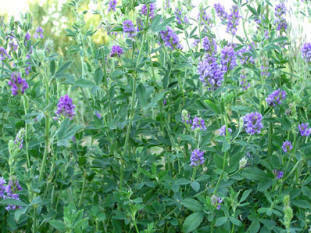 However, alfalfa is valuable as livestock feed and has the highest price of all crops ($250/ton). In addition, alfalfa is a legume which means it can fix it's own nitrogen from the air so it requires little or no fertilizer. Also because alfalfa is a perennial, it does not need to be replanted year after year so does not cost as much to produce. The combination of high price and low costs makes alfalfa profitable despite the lower yields. Alfalfa is similar to switchgrass in its environmental benefits. Alfalfa as a deep root system which takes CO2 out of the air, stores it in the soil and builds up organic matter which is the foundation of a healthy soil. The nitrogen that the alfalfa fixes through its roots builds up and adds soil fertility over time. Because it requires little fertilizer and does not need to be tilled, alfalfa fields have low erosion and nitrate leaching, which is good for the water quality. Alfalfa is grown as a monoculture but because it is a perennial, it provides more reliable habitat for birds, insects and other wildlife. In particular, the flowers provide a valuable food source for beneficial insects. Built into the game is the ability to change fertilizer levels (high or low) for crops and change the field tilling practice (till or no till). By default, players do not have the ability to adjust these these field management settings but the game moderator can enable this option so that players have an additional "Management Stage" after Planting. In a basic game, where players cannot change these option, fertilizer is set to a "high" level and fields are tilled. The fertilizer and tillage options and effects are described briefly here. When management options are enabled you can set the fertilizer level to "Low" or "High" for each crop by clicking the fertilizer icon during the Management Stage. The fertilizer simulated in the game is nitrate, a form of nitrogen required for plant growth. The high or low quantity of nitrogen fertilizer simulated is specific to each crop. Therefore, both the high and low levels for corn are higher than switchgrass because corn requires more fertilizer to grow. More nitrate leaching into the groundwater and hurting the water quality. In sum, fertilizer can boost your energy and economic scores, but hurt your environment scores. So you have to decide if this is tradeoff is worth it. Also, keep in mind that some crops like corn respond better to more fertilizer than switchgrass or alfalfa. Also remember that in the basic version of the game without the optional Management Stage, fertilizer levels are automatically set to high levels. See the Scoring and Models section for additional details on the fertilizer effects and soil fertility models. When field management is enabled, you can select to till or not to till your fields. Most farmers will till their fields with tractor-pulled plows before planting crops at the beginning and end of the season. Tilling is the process of stirring, digging or overturning the soil. Tilling helps remove weeds, mix in dead plant matter, mixes air into the soil and makes it easier to plant crops. By mixing oxygen in the soil, tilling promotes decomposition which release nitrates into the soil that plants can then use for growth. However, tilling also requires energy, costs time and money, and produces greenhouse gas emissions both from tractors and from the soil through decomposition. Over time, tilling can reduce the amount of soil organic matter. Soil organic matter hold nutrients and water and serves as the foundation or the soil ecosystem. Overall soil health declines over time with less organic matter. Tilling can also increase soil erosion as digging and plowing expose the soil to the effects of wind and water. Small boost in yields due to release soil nitrates from decomposition, in turn an increase in energy production and profits. Higher leaching of nitrates into the groundwater. Long-term reducing of soil organic matter and soil health if soils are tilled year after year for many years. As you decide whether to till or not to till your soil, consider these pros and cons. In sum, tilling can produce a small boost to energy and economy scores, but hurt your environment score. Since perennial crops like switchgrass and alfalfa regrow from their roots every year, you will only be able to till these crops in the first year of planting. If you leave these crops in the field in future years, tilling will not be an option. Also remember that in the basic version of the game without the optional Management Stage, tillage is turned "on" by default. See the Scoring and Models section for additional details on the effects of tillage on the soil and crops.